It’s me again, Hank the Cowdog. At this point, you don’t know The Big Question and I’m not in a position to tell you, not yet. See, it’s classified information, very secret, and we can’t go public with it until later in the story. Can you wait? Good. Let’s get on with the story. It’s a dandy. Okay, Loper and Sally May had gone to Abilene to spend Christmas with Sally May’s kinfolks, so Slim Chance was holding down the ranch by himself. Actually, I was running the show, but you know how it is with these cowboys. We let ‘em take most of the credit, but everyone knows who’s really calling the shots. The Head of Ranch Security. It was a clear, warm day, kind of unusual for December, and we spent the afternoon hauling a hundred head of steers to a wheat field about five miles west of ranch headquarters. Have we discussed wheat pasture? Maybe not. Around here, our pasture grass stops growing and turns brown after first frost, which comes around the middle of October. After frost, we don’t have a sprig of anything green on the ranch until the middle of April when we get the first grass of the spring. Over those long dark months of winter, the only greenery you’ll find in the Texas Panhandle will be in wheat fields, because wheat grows and stays green over the winter. Why? I have no idea, but it does, and it makes excellent grazing for yearling cattle. That’s why, every year between Thanksgiving and Christmas, we haul yearlings from the main ranch and dump them out on wheat fields. They’ll stay on wheat pasture until the middle of March, when we have to bring them back to the ranch and put them out on grass again. In a good year, they’ll gain two or three pounds a day on green wheat. It’s pretty impressive that a dog would know so much about ranch management, isn’t it? You bet, but there’s even more. See, you probably don’t know that most wheat fields don’t have permanent fencing, so before we turn out the cattle, we have to put up a temporary fence made of small steel posts and a thin strand of wire. It’s called an electric fence. (You might want to take some notes on this). We call it an electric fence because it’s hooked up to a battery that…I’m not sure what it does, but somehow it puts a little jolt of electricity through the wire, and if a steer touches the wire, he gets a shock. That’s the whole point of an electric fence, don’t you see, it keeps the cattle inside the wheat field, where they belong. If an electric fence ever shorts out or quits working, that’s bad news, because cattle are so dumb, they’ll walk through the fence and then you’ve got stray cattle running loose. That was a special concern on this particular wheat field. It lay on the north side of a highway, and a guy never wants his cattle walking down the middle of a busy highway, because guess what you find on a busy highway. Cars and trucks. You know what happens when an eighteen-wheeler meets a five hundred pound steer in the middle of the road? It’s not pretty, and that’s the kind of thing that causes cowboys to worry in the middle of the night, cattle on the highway. You’ll want to remember this because later on in the story…actually, I’m not supposed to reveal this information, so forget that I mentioned it. In fact, I didn’t mention it. Thanks. Where were we? Oh yes, the day before Christmas, we delivered the last trailer-load of steers and kicked them out on a wheat field five miles west of ranch headquarters. And naturally, before we left, we had to make sure the fence was hot. Under ordinary circumstances, a cowboy checks the electric fence with a little device called a fence tester, a plastic thing with two wires attached. He sticks one wire on the fence and the other on a steel post. If the fence is hot, it makes a little light come on. 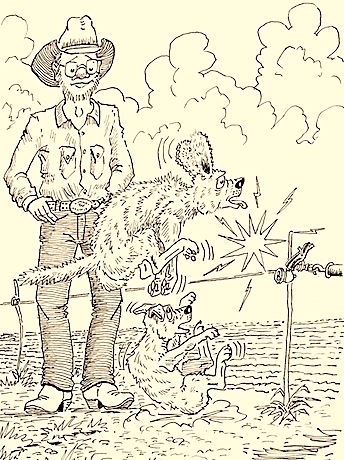 But you might recall that on our ranch, we have these cowboy-jokers who love to pull pranks on their dogs. While all the normal people in the world are thinking about the weather or the stock market, our cowboys are scheming up new and exciting ways of playing childish tricks on their dogs. That’s what Slim Chance was doing. While Drover and I were busy checking out a gopher mound, Slim was messing with the electric fence. Vaguely, I heard him say, “Dern the luck, I forgot my fence tester.” I thought no more about it. Well, you know me. Any time I can lend a hand, I’m glad to do it. Drover and I were pretty busy, doing a Gopher Probe, but we’d been called into action, so we trotted over to Slim. Beef jerky? Hey, that was the easiest question of the year. I pushed Drover aside, swaggered up to the fence, and proceeded to sniff the…POP! Holy smokes, a spark of electricity bit me on the end of the nose, and you talk about a stampede! Fellers, I ran smooth over the top of little Drover and was heading toward Del Rio when it suddenly occurred to me that Slim was…well, laughing. I slowed to a walk, then stopped. I went to Puzzled Wags on the tail section. What was the meaning of this? Oh great. I saved him from…you see what we have to put up with around here? Oh well, it didn’t cause any permanent damage to the nose, and I ended up getting pats, rubs, and the piece of jerky, so maybe it wasn’t such a bad deal. But if you ask me, Slim enjoyed it a little more than he should have. Anyway, we got our work done and made it back to Slim’s shack before dark, and the next day, we had ourselves a bachelor Christmas. It didn’t amount to much. There are many things that bachelors don’t do for Christmas. They don’t put up decorations, send Christmas cards, buy presents, bake cookies, or invite a houseful of kinfolks to come for the holidays. Yes, Christmas at Slim’s shack was a pretty quiet affair. He’d cut himself a little juniper tree up in the canyons and decorated it with a tin foil star and a few strings of popcorn, and that was about all. Oh, wait, I almost forgot. Before he went into the kitchen to cook Christmas dinner, he sang us a song, and get this: it was a song about Cowboy Cooking. Well, for Slim Chance, that was a pretty good musical effort. It wasn’t as corny as most of his songs, and I can tell you that it was based on true life experience. I mean, the guy actually does those things. He didn’t get his ideas out of a book. But for that particular Christmas meal, he didn’t cook either ‘taters or ‘maters. He fixed a turkey...well, part of a turkey. Boiled turkey necks. He’d found them on sale at the grocery store in Twitchell, ten pounds of necks for three bucks. He cooked them all in a big pot, don’t you see. What he didn’t eat, he threw into a bread bag and placed it in the ice box, which left him enough pre-cooked meals to last several weeks. Then he deep-freezed the pot so he didn’t have to wash it. Pretty shrewd. Oh, and did I mention that he gave me and Drover a neck apiece? He did. It was our Christmas present, and he even let us eat them inside the house. That was pretty generous of him, and I can tell you that I spent a very pleasant afternoon, gnawing on all those funny-looking neck bones. Drover enjoyed his too, until tragedy struck. No, he didn’t choke on a bone. Toward the middle of the afternoon, after he’d chewed up about half of his turkey neck, he fell asleep and somebody stole the rest of it. It almost broke his little heart and I had to spend some time helping him through his grief. You’ll never guess who stole it. Hee hee. Or maybe you would. Well, why not? If you get careless with your dinner, it’s liable to sprout legs and walk away, and that’s probably what happened, come to think of it. That turkey neck just, well, grew legs and walked out the door.